The Innov-ís BQ1350 gives you all the tools you need to transform both your wardrobe and home. Sewers will take garment construction to new heights with 290 built-in sewing stitches and the My Custom Stitch™ feature, which allows you to create personalized stitches. Whether you're sewing silk or denim, the Automatic Height Adjuster™ (AHA®) feature will help deliver smooth, even stitches every time. Quilters will delight in the large workspace and range of accessories including a wide table that make quilting fun and easy. You'll also love the Pivot function, which allows you to keep your hands free to rotate your fabric for virtually perfect corners. Feel inspired to tackle projects you never thought were possible with the Innov-ís BQ1350! Built-in stitches, buttonhole styles and fonts: 290 built-in sewing stitches, including 58 combinable stitches and 10 styles of one-step auto-size buttonholes and 5 sewing lettering fonts. Sideways sewing: perfect for sewing patches and appliqués on projects using the straight or zigzag stitch, with the horizontal sewing capability. Automatic Height Adjuster™ (AHA®) feature: the AHA® feature helps ensure consistent stitch length on all fabric thicknesses by keeping the presser foot pressure consistent, regardless of fabric thickness, leading to uniform stitch quality across uneven surfaces. Pivot function: the presser foot automatically lifts as the needle remains lowered for fast and easy fabric manipulation. What To Look For In A Quilting Machine. If you are brand new to quilting, or if you want to get the best quilting experience from your sewing machine, here are some features and functions to look for that make quilting easier. for straight stitching when sewing thin fabrics. and 5 sewing lettering fonts. accommodate up to mid-size quilts and projects. remains lowered for fast and easy fabric manipulation. the slot, trim, and start sewing. 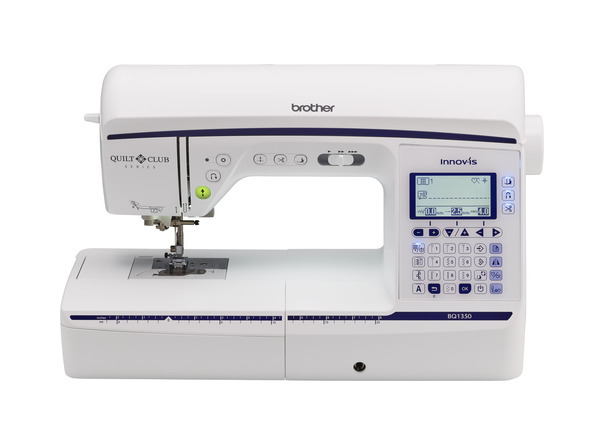 Overview The Innov-ís BQ1350 affordable sewing and quilting machine is perfect for the inspired quilter! 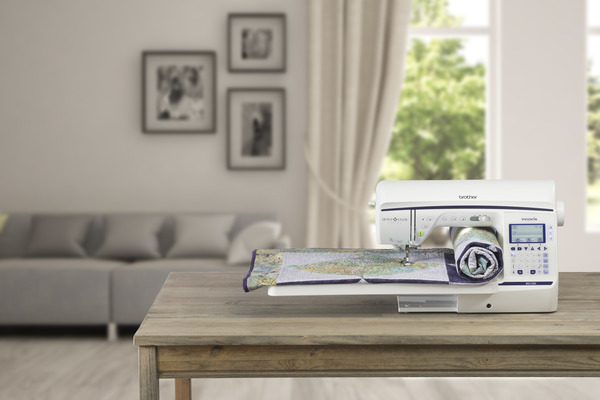 Enjoy virtually endless creativity with 290 built-in sewing stitches and the Brother-exclusive My Custom Stitch feature so you can create your own personalized stitches. Work on small to mid-size quilts with ease on the large workspace and included wide table. The longer feed dogs and J foot for powerful feeding offer a smoother sewing experience and stitch consistency. The BQ1350 Quilters Bundle includes a two-spool thread stand, which can hold up to two king thread spools, and a straight stitch foot and straight stitch needle plate for straight stitching when sewing thin fabrics. Built-in stitches, buttonhole styles and fonts • 290 built-in sewing stitches, including 58 combinable stitches, 10 styles of one-step auto-size buttonholes, and 5 sewing lettering fonts. 8.3" from needle to arm • Easily maneuver fabric when working on creating the perfect quilt. Automatic Height Adjuster (AHA) feature • The AHA feature helps ensure consistent stitch length on all fabric thicknesses by keeping the presser foot pressure consistent, regardless of fabric thickness, leading to consistent stitch quality across uneven surfaces. Sideways sewing • Can be used with straight or zigzag stitches, providing many new creative design opportunities for your projects. 4.1" x 8.3" workspace, ideal for small to mid-size quilts • A dream for any quilter, and with the ability to accommodate up to mid-size quilts and projects. Pivot function • The presser foot automatically lifts as the needle remains lowered for fast and easy fabric manipulation. Improved sewing • Experience a smoother sewing experience with longer feed dogs and J foot for powerful feeding and stitch consistency. Lockstitch key • Automatically sew a tie-off stitch or easily sew a block of decorative stitches. My Custom Stitch feature • Create personalized sewing stitches and save for future use. 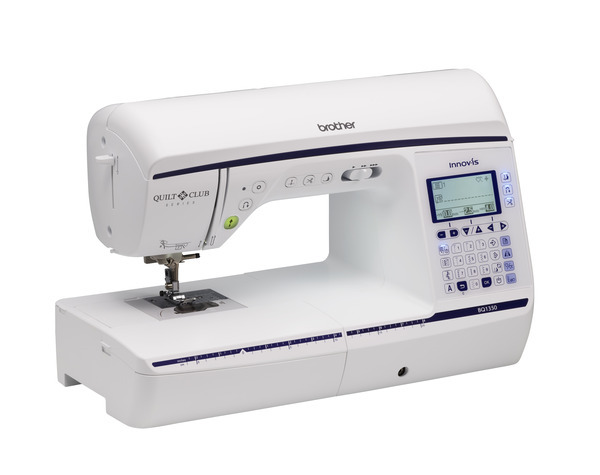 Advanced needle threading system and automatic thread tension • With the push of a button, the thread is pushed through the eye of the needle. Jam-resistant Quick-Set drop-in top bobbin • Just drop in a full bobbin, pull the thread through the slot, trim, and start sewing.